Management Sciences for Health commenced the scale up of Community Therapeutic Care (CTC) services as part of the US Office of Foreign Disaster Assistance (OFDA) famine response at the end of January 2006. Services were scaled up to 59 sites from an original 6 sites in five districts. Services were and are currently being implemented through Ministry of Health (MoH) and other non-governmental organization sites by personnel employed at these institutions. District Health Management Teams (DHMT) in the 5 districts were involved in planning for and supervising services. During the period from January 2006-January 2007, 5,557 severe and acutely malnourished children were enrolled into the program. Of these 85.5% were cured, 10.1% defaulted and 2.4% died. This performance met standard SPHERE criteria for exit indicators. Other inputs include the training of 3,787 personnel and volunteers and provision of essential equipment and supplies such as Chiponde, weighing scales, MUAC tapes, height boards and cupboards for the secure storage of Chiponde. DHMTs were assisted to plan for the ongoing integration of CTC into routine district operations especially through the use of the annual District Implementation Planning process. A substantial network of community volunteers (1,546) was built up around the service provision sites. At district level local nutrition coordination committees called District Targeted Nutrition Forums were re-vitalized. The implementation of the program saw collaboration between the Nutrition Unit of the MoH, DHMTs, and organizations such as Valid International, Concern Worldwide and UNICEF. The one year program demonstrated that CTC can be effectively implemented through peripheral health facilities. MoH and NGO staff, together with volunteers, grasp the concept very well and are able to effectively implement this program. A further success of the program has been to widely increased access to nutrition services for children with severe, acute malnutrition (SAM). Depending on individual district characteristics (number of NRUs and number of OTP sites), stand alone outpatient therapeutic program (OTP) sites (those which are not operating immediately adjacent to existing NRUs) have managed between 72% and 80% of all OTP admissions. This represents a huge contribution to keeping mothers at home and children within their family groupings. Data suggests that newly created OTPs have contributed towards meeting a huge unmet need for nutritional support with increased numbers of children entering the CTC program despite agricultural conditions being much improved. 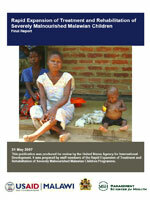 In Mulanje, immediately prior to the 2005 famine, 362 children were admitted with SAM at 2 service provision sites (NRUs) whilst in the post-famine period 1,473 children were admitted at 10 OTP sites вЂ“ a good example of more cases being detected despite much improved agricultural conditions. Future challenges to sustaining CTC include a need to expand the current number of OTP sites bringing them closer to where the people live, a mechanism to ensure a secure supply of Chiponde, ensuring an effective supervision and support system by DHMTs and harmonizing disparate nutrition interventions such as institutional nutrition management, supplementary feeding programs and general food support programs at district level.